"We're on the verge of greatness." Greatness awaits you with the upcoming X-Wing™ Store Championships! Your favorite local game store plays many roles in your X-Wing community. It's your supply depot. Your headquarters. The site of your weekly starfighter battles. It's a training ground where you can test new squadrons, and learn how to fly the newest ships. And once each year—during the Store Championships season—your store becomes your proving ground, the battlefield where you'll test yourself against the best local competition. What's at stake in this annual Store Championship? Local bragging rights, for starters. Store Championships take place only once per year, meaning your victory is always a memorable and lasting triumph. But the lasting nature of your triumph is amplified in 2018 by the fact that the Store Championships will be replaced in the future by the Wave Championships coming with the game's second edition. Win this year, and you'll be your store's final X-Wing first edition Store Champion! For those of us who don't like to brag (much), the Store Championships also provide a chance to win some of the coolest prizes you'll see at your store all year long. In fact, as you enjoy the battles of this year's Store Championships—and look forward to the renewed conflicts of X-Wing Second Edition—you'll find this season's prizes are ready to serve double-duty: the extended art and alternate art cards that you can win at this year's Store Championships are double-sided so that you can use them in both the game's first and second editions! 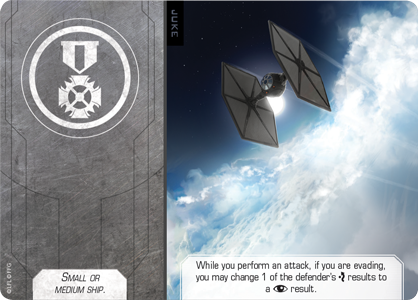 As a game of starfighter dogfights, X-Wing handsomely rewards your ability to outmaneuver your opponents, and there are few feelings in the game quite so sweet as slipping out of your enemy's firing arc to line up a perfect Range 1 shot with focus and target lock. One of the feelings that might compete with lining up the perfect shot, however, is the feeling you get when your ace pilot stares down your opponent's whole squadron and emerges from the volley of fire completely unscathed. And then there's the feeling you get when you pair your attack and defense options perfectly—such as when your evasive action allows you to catch an enemy ship completely unprepared for the retaliatory fire. Juke and fire. 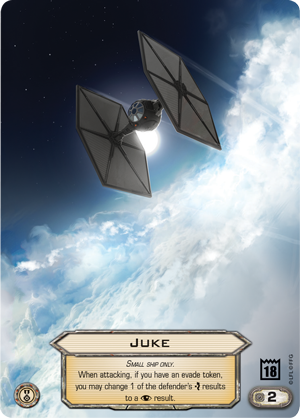 And you can capture this feeling with the extended art Juke available to the Top 32 players at each 2018 X-Wing Store Championship! This double-sided upgrade comes ready for play in both first and second edition—with a game effect that works the same in both editions, albeit with wording that reflects each edition's specific language conventions. To battle your way toward the top tables at your Store Championship, you'll need to demonstrate a good eye for distance. Failing to bring one of your biggest ships into the opening engagements can prove disastrous, as can losing the synergies from your range-dependent ship and upgrade abilities. As a reward for your keen eye—and to help you refine your ability to judge those distances—everyone who makes the Top 8 at a 2018 X-Wing Store Championship will win a complete set of three range rulers—Range 1-3, Range 1-2, and Range 1. While the standard range ruler for Range 1-3 is great for lining up most of your shots, the shorter range rulers are great for checking exact distances when ships are—maybe—at Range 1 of each other. And they make placing your obstacles during setup all that much easier and quicker. 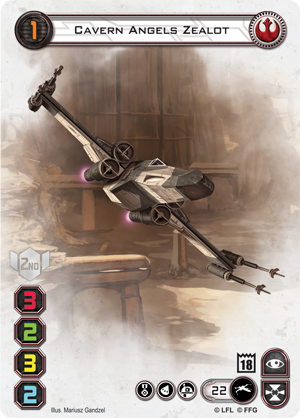 What can you say about the Top 4 participants at each 2018 X-Wing Store Championship? Well, they all stand on the verge of greatness. Only one will end up claiming the title of Store Champion, but at the point you make the Top 4, you've earned the right to quote Director Krennic's line about being so close to bringing "peace" and "security" to the galaxy. 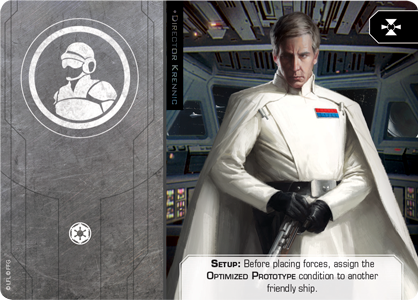 You'll also have earned a double-sided, alternate art version of the Director Krennic upgrade for both first and second edition. A self-important genius in both editions, Director Krennic allows you to enhance your Imperial fleet by assigning the Optimized Prototype condition to one of your ships. The condition functions a bit differently in the different editions, but in both editions, it improves the ship it modifies—optimizes it, you might say—affording it greater offensive potential and linking it to Director Krennic and his ship's target locks. 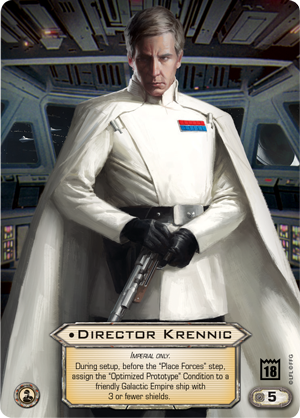 Also, it just makes your squad look better when you enhance it with this alternate art version of Director Krennic. Just as the Top 2 players at each 2018 X-Wing Store Championship find themselves greatly outnumbered by all the players they had to beat to keep going, the members of the Rebel Alliance were always outnumbered by Imperial forces. Nonetheless, they kept fighting, and that fight translates to the Top 2 prize in the form of a plastic Cavern Angels Zealot ship card. Arguably the most iconic of Star Wars starfighters, the X-wing proved to be just the fighter the Rebel Alliance needed. Its speed and firepower gave it a good measure of versatility, and the introduction of the Cavern Angels Zealot ship card in the Saw's Renegades Expansion Pack carries some of this versatility back into X-Wing. Along with the Renegade Refit upgrade, the Cavern Angels Zealot ship card provides you the option of running a squadron with as many as five X-wings at a pilot skill value of either one or two. You can use the lower pilot skill value of one on the Cavern Angels Zealot to block your opponent's flight paths, or you can fly the Rookie Pilot to shoot slightly earlier in the combat phase, potentially firing ahead of your opponent's Academy Pilots or Zealous Recruits. After all is said and done, each store will name only one X-Wing Store Champion, and this Champion will truly be able to look with pride upon his or her accomplishments, having claimed the title of Store Champion forever. 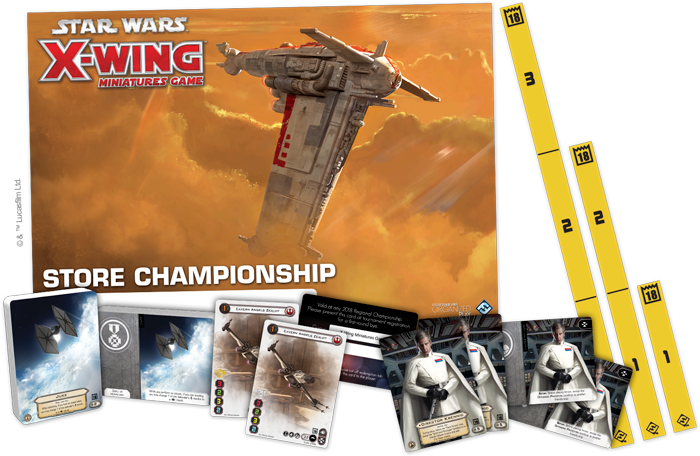 Instead, as we mentioned earlier, the Organized Play program for X-Wing Second Edition will replace the annual Store Championships with the Wave Championships supported by our Deluxe Wave Kits. Similarly, Regional Championships will be replaced by two separate seasons of Hyperspace Trials and Hyperspace Cups. Nonetheless, if you claim the title of 2018 X-Wing Store Champion, you will still be able to leverage your victory toward success at the next level of events. Your victory will earn you a Regional Championship Prize Bye, and though you won't be able to redeem this Prize Bye at a Regional Championship, you will be able to apply it toward a future Hyperspace Trial. X-Wing remains the greatest tabletop starfighter game in the galaxy, and the 2018 X-Wing Store Championships are your chance to pursue greatness and glory within the game. Enjoy fantastic, high-speed starfighter duels. Claim local bragging rights. Blaze a trajectory toward success in the game's second edition. At the 2018 X-Wing Store Championships, anything can happen. Any ship can find its way to the top tables. So talk to your local retailer today to find out when they'll be running their Store Championships! 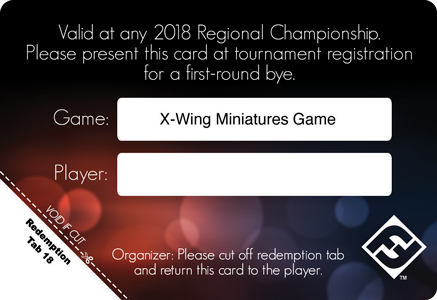 Note: The 2018 X-Wing Store Championship season was moved to incorporate the second edition prize materials. All 2018 X-Wing Store Championships will utilize the game's first edition.